This Scapular was given by the Blessed Virgin Mary to St. Peter Nolasco on Aug. 2, 1218, for the redemption of captive Christians. The Blessed Virgin Mary appeared in separate visions on the same night to St. Peter Nolasco, to St. Raymond of Penafort (a Spanish Dominican), and to James 1st, King of Aragon, Spain. Our Lady's request was for the establishment of an order for the ransoming of Christian slaves. King James insisted that the shield of Aragon be placed on the scapular. The opposite side bears the "A" & "M" for the Ave Maria. Today, the Scapular of Mercy is used for the ransoming and redeeming of souls from the devil. 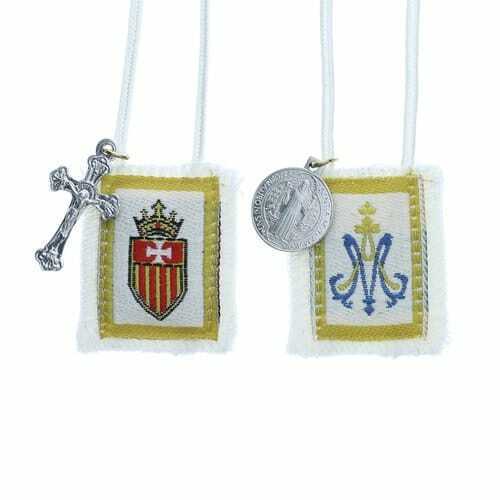 Made of 100% wool with crucifix, St. Benedict Jubilee Medal, and accompanying prayers. Made in the USA.